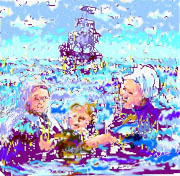 Reproduction of digital image, Jeanie Johnston: 8-1/2"x11", $25.00 (includes shipping and handling charges). Also includes a written history. This painting of three immigrants with a sailing ship behind them actually came to me in a dream, the only time that ever happened. It is one of my first computer art pieces - I am still learning. This piece is for display only, it is not for sale. 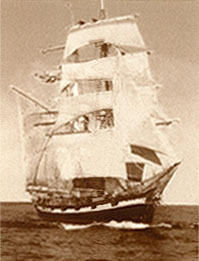 The 19th century immigrant ship Jeanie Johnston brought Irish famine immigrants to North America. Unlike many "coffin ships," which lost many passengers on the sea voyage, the Jeanie Johnston had a doctor on board, and did not lose a single passenger or crew member on its voyages between Ireland and this continent. The ship was re-created in Ireland, and sailed to Canada and America, arriving in Florida on April 15, 2003. I made this digital image from various photographs, some artwork, and computer effects. It is what the ship would have looked like in a photograph of 150 years ago. See Order page for more information on ordering original paintings. Buyers outside the U.S.A., see International Ordering Information. Jeanie returned to Ireland in October 2003. For current news, visit www.focuskerry.com/jeanie/. Those living outside the United States can order an artwork by sending an American Express gift or travelers check for the amount of the work desired, made out to Nancy Doyle. Please also specify which work you wish to purchase, and include your name, e-mail address, shipping address. (If you are ordering a Jeanie Johnston print, please specify that you wish to buy a sepia Jeanie Johnston image.) This check can be mailed to Nancy Doyle, 120 Jenners Pond Rd., Apt. 3314, West Grove, PA, USA. As soon as I receive your payment, I will ship your item to you (shipping charges are included in the price of the works). There were 11 crew members and about 27 passengers on her 2003 Atlantic voyage; many of the passengers were young people from the north and south of Ireland, who had worked on Jeanie's re-creation. Tom Kindre, the only American on the recent Atlantic voyage (and 80 years of age), has expressed the hope that once this visit was over, Jeanie would become a 'peace ship,' that is as a vessel with crewmembers from war-torn parts of the world (with culturally divided peoples forming her crew). See photos of Jeanie in Philadelphia in June 2003.